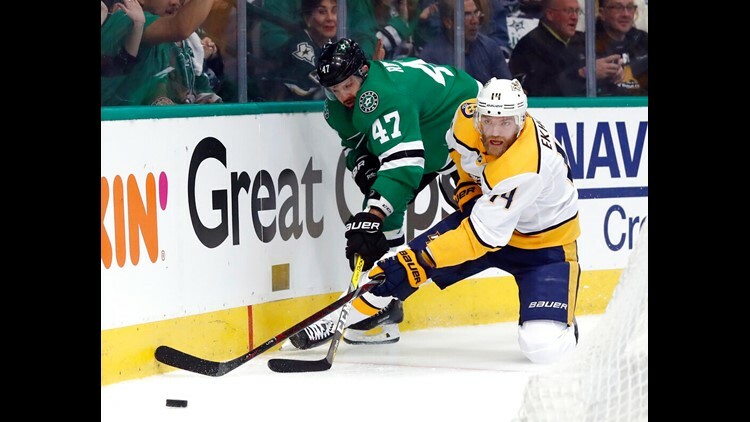 DALLAS — (AP) Mikael Granlund scored on a wrist shot from just inside the blue line with 8:19 left and the Nashville Predators, after blowing a two-goal lead, beat the Dallas Stars 3-2 on Monday night to take a 2-1 lead in their best-of-seven Western Conference playoff series. Tyler Seguin and Mats Zuccarello scored for the Stars, who played their first playoff home game in three years. American Airlines Center is less than 5 miles from the Cotton Bowl Stadium where they will play the Predators outside in the Winter Classic on New Year's Day next season. Granlund's game-winner came only about 3½ minutes after the Stars got even at 2 on a goal from Tyler Seguin on a backhand pass from Benn following some interesting puck play behind the net. Grimaldo didn't have a goal in the last 13 regular-season games after scoring Feb. 19 at Dallas. The center was a scratch in the opener of this series scored a goal in Game 2 while filling in for Brian Boyle, who had an appendectomy after Game 1 and is considered week-to-week. NOTES: Dallas was 0 for 4 on power plays and is 1 for 13 in the series. Nashville is 0 for 8 after failing to score on its only chance with an advantage. ... The Predators announced Boyle's appendectomy earlier Monday. He joined RW Wayne Simmonds as being week-to-week. Simmonds took a shot off his knee in Game 2. ... Dirk Nowitzki was back in the building where a week ago he announced his retirement after a record 21 seasons with the NBA's Dallas Mavericks and was honored with an elaborate ceremony after his final home game. The crowd went wild when Nowitzki was shown in a suite wearing a Stars playoff T-shirt and waving a rally towel.